Geometry classes, Problem 961. Quadrilateral, Trisection, Sides, Sum of Areas, Sketch, Software, iPad. Math teacher Master Degree. College, SAT Prep. Elearning, Online math tutor, LMS. The figure below shows a quadrilateral ABCD. Points E, F, G, H, M, N, P, and Q trisect the sides (divide each side into three equal parts). 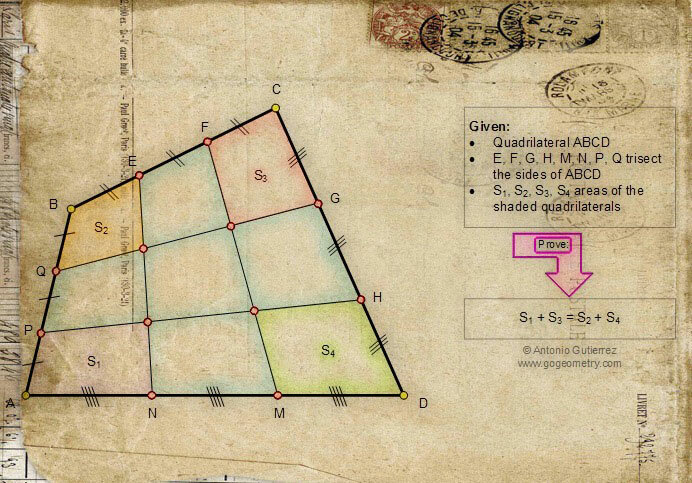 If S1, S2, S3, and S4 are the areas of the shaded quadrilaterals, prove that: S1 + S3, = S2 + S4.